1) ADVERTISING ~ Have good signage that makes it easy for potential customers to find you. Make sure to place signs where people can see them coming from all directions. Put a sign decorated with colorful balloons / flags / streamers at the foot of your driveway. Remember to take them down after your sale ends. Also, hang a sign on your local grocery store bulletin board and create a free ad on Craigslist. 3) ORGANIZATION ~ Try to organize your sale tables into departments … tools, toys, books, clothes, jewelry, kitchenware … etc. Try to lay everything out on a table, many people don’t like digging through boxes under tables. If possible, try to “display” items … for example, if you are selling dishes, display a place setting showing each piece in the set. For jewelry, display each piece in a separate compartment (not tangled up) or to show earrings, hang them on a piece of screen. 4) PRICING ~ Have everything priced ahead of time. Many customers will ask for a lower price, be prepared to haggle. Remember, everyone is looking for a bargain … so don’t expect to get the price a store would charge. Also, while you are pricing, try to wipe off / clean everything (no one wants to look at dusty or dirty items). 6) CHECK-OUT ~ Have your check-out area in an obvious place … a patio table with an umbrella set up for shade would be great. 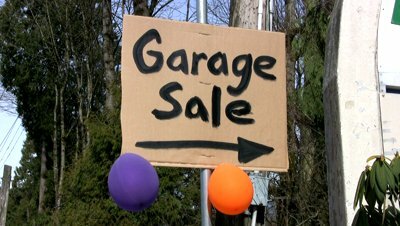 Have it near an outlet with an extension cord, so people can make sure their item works before purchasing (most garage sales have a NO RETURNS policy). Have an assortment on batteries on hand too. 7) CORRECT CHANGE ~ Have plenty of singles and coins to make change. It seems like everyone wants to pay with a twenty dollar bill and the singles can run out fast. 8) BAGS ~ Have plenty of bags or boxes (save them from shopping) for your customers to carry their treasures (purchases) home. If you are selling furniture or large pieces, have some rope or twine available for them to tie the trunk down or secure it on the roof of their car. 9) REFRESHMENTS ~ Have some candy or cookies for sale at your check-out area … have some water bottles on ice, too. Nothing is better on a hot summer day ! 10) SECURITY ~ Sadly, this is something you need to be aware of. Pay attention when a large group of customers come together (especially with kids). One may ask questions to distract you, while their friend steals something … I speak from personal experience 🙁 Also, don’t put their payment in with your money until you have made their change … they could say they gave you a 20 dollar bill when they really gave you a 10 (again, personal experience). If possible, have another family member run the sale with you, or maybe ask a friend to keep you company for the day. 11) BONUS TIP ~ Offer some FREE items … little trinkets or small toys (stuffed animals or McD’s happy meal toys). Keep your FREE box at your check-out area and place a couple signs on your tables advertising a “free gift” with your purchase. Who doesn’t LOVE getting something for FREE ? This entry was posted in My Thoughts & Opinions, Organization, Personal Assistant, Tips and tagged Book, garage sales, Giveaway, organized, summer, Tips, Top 10 on April 24, 2015 by Tracy.